Look what came in the mail yesterday! My hardcover copy of B/X Essentials: Monsters. This is currently a cool project I am following, a digest-ifi-cation of the B/X rules and a project that feels like a solid basis for creating B/X style games on, where you can add and remove books at will to simulate a variety of settings without introducing cruft or out-of-genre parts to the game. 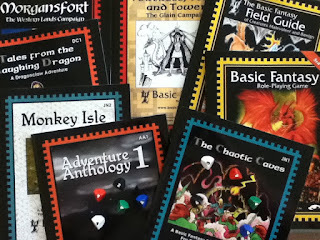 The basic rules book is really all you need to get started, and you choose what to add with other books. Tabletop Simulator. I gifted my friend this on Steam during last weekend's sale and we played around with this, and she enjoyed it a lot. I wanted to play traditional pen-and-paper games with her right away but we ended up playing with the physics sandbox a whole lot, and then we played a couple traditional games, and then we made up our own games with the pieces we had available. I gave her spawn permissions and she had a blast. She crashed one game by spawning a couple dozen bowls into the game all at once but live and learn. We are still playing this and her interest is shifting to pen-and-paper games, and I find that this sort of online play tool with a lot of other things and games to play is ideal for introducing new players to online play. While this isn't as full featured as a Roll20 or other dedicated virtual tabletops, there is a lot of "other stuff" to do to get someone interested in virtual gaming than other packages. We can play chess, checkers, Chinese checkers, dominoes, poker, or any other board game she was familiar with. We got used to how online tabletop gaming worked with familiar games. The downside is that we need to stick to simpler games, such as B/X style games, and that is also an upside as well. I can get complicated character sheets for "big book" games, but I would rather not. I would like to keep it simple and just use the note cards and a simple set of rules. I don't want to overwhelm players with complicated setups to start, though it is nice to have workshop content to cover these games. This is an excellent introduction and sandbox for new players and we are both happy we set this up. I put in my order for the B/X Essentials: Monsters book over on DriveThru RPG today and now I start the waiting. I have the PDF, I just love the feel and size of these digest style books, and having a hard copy takes me back to days gone by. A new collection starts and it feels good again. This one is a couple years old, but it is a cool throwback freebie from the game's publisher, Steve Jackson Games. If you like to see what the pre-computer world of 1/10th of a second car combat sims was like, here is a good chance to turn back the clock and spend 4 hours simulating 20 seconds of car combat. We loved this game so much it lasted 40 years of tabletop gaming, and even the setting was iconic throughout our gaming years. I was talking to a friend about playing a traditional pen-and-paper RPG with her over Tabletop Simulator, Basic Fantasy in fact. I like Basic Fantasy for new players mainly because of the modern-style AC system, the AC of a monster is the target number, and that is what you have to roll higher than to-hit. No attack charts needed, and what you see is what you have to roll. Another "hard to start" issue with pen-and-paper games is inherently their open-endedness. With a game like Monopoly, there is a set board, set pieces, and a set world in a box that a player can figure out. This makes me miss the old Dungeon board game from TSR that was sort of the same way, a set board, a set world, and an ever increasing cave of danger with keyed room colors and stacks of cards for each "level" of the dungeon. I sit here as an experienced DM with over 40 years of experience and there is a part of me saying, "Of course it is open ended with no map! That is where the fun is!" And then there is the new player part of me saying, "I can understand why the hesitance. I can see why someone would ask, what am I getting into?" There is no map. The rules leave a lot up to interpretation. The DM can kill my character for any reason, even a stupid mistake. The world is unforgiving, as I could wander into a dangerous part of the dungeon and it is game over. I could run out of supplies down there, or worse yet, get lost. I could roll bad and it is game over. How do I trust the DM is being fair? How do I know when the dungeon is over? What if I don't want to be a part of a story, and I just want to play combat? What if I hate combat and just want to play a story? Halfway through that list of fears that I came up with...I started to want to play the game, because I realized no other game was like this. It is a strange thought that the bad parts that a "traditional family board gamer" can come up with are actually strong selling points of a pen-and-paper game. But I need to work harder at this I feel, harder at "selling" that fairness part of being a DM. A lot of the hesitance I feel at getting new players excited is the inherent mistrust of the dungeon master. That a DM won't be fair. That a DM will make it up as the game goes on. That a DM will look for every chance to TPK the party. That the DM will change things secretly in the background to either make things harder or easier. That a DM has secrets and can't be trusted. That a DM will use the player's misfortune as a source of enjoyment. Again, as a DM with over 40 years of experience I laugh at those statements, but with my friend I can see how those same fears can just make someone say, "I can't put that must trust in someone so I am going to walk away." With traditional board games, the game board is the DM. They are inanimate objects and the interaction between the pawns on the board and the rules define the "world" and the interactions between them are physical and can be understood in a 1-to-1 relationship. Like the Dungeon board game, you have these passages and rooms, you roll dice to move, and to pull cards to see what monster is in a room and your character card gives you the information you need to succeed in that battle. If you win, you pull a treasure card. The trust is there built into the game, except the trust is contained within the world the game's designer drew on the map and built into the interactions with the pawns and game board. I see all the game's pieces, therefore my trust is built by the interactions between them. D&D 4 was like this for us. It was "battle chess" for our group. The game was played on dungeon tiles. You didn't really need a DM, as you could setup the scenario and go. You could round-robin the monster's turn among players and have the monsters act to the best of their abilities. I have this feeling how I am going to solve this is hold up one of my modules and say, "we are playing this, my job is to tell you what happens depending on where you go." It sounds so simple and obvious that I wonder why I am even writing this article, because that is what you are supposed to do. It is simple, right? But for my friend, it isn't. She has no concept of any of this. For us in the hobby, this is easy. For outsiders, it is not so easy. That is why I am writing this. That published module becomes "the game board" in her eyes, the "story book" she will adventure through. I feel this would all be harder if I were to wing it and make things up, because, "what are we doing?" I love narrative games where the action goes wherever the players drive the story to through their actions, but another part of me loves the, "buy it and solve it" style of play with prepackaged adventures. Later on, if we ever meet people who played these adventures as well we can share stories. This becomes an experience she can talk about to others, and they can have that same experience - and they know the game's name, the adventure, and that becomes something she can share more than, "That person played this game with me and was a really good DM and he made things up and I had fun. I don't know the name what we played but we had fun." Winging it can come later, and more story-oriented play can come later. She may just have fun doing this and that is all we do. For now, I think I solved the problem, even if this solution was the way I was supposed to do it in the first place. But thinking through this in a different way gives me the perspective from her viewpoint, and I find that very helpful for introducing the game to her and all it has to offer.